Parecomic is a graphic novel about something that affects us all: the system we live in—what's wrong with it, and how we might be able change it for the better. 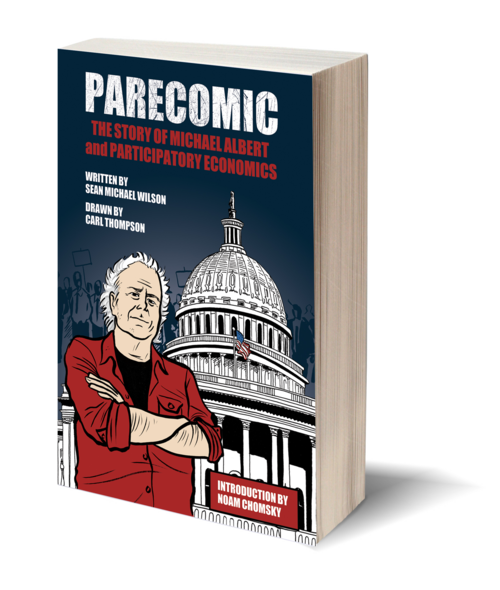 Written by Sean Michael Wilson, and drawn by Carl Thompson, Parecomic is about Michael Albert—the visionary behind "participatory economics"—and his life's struggle as a left-wing activist in the US. Proposed as an alternative to capitalism, participatory economics (parecon, for short) values equity, solidarity, diversity, and participatory self-management. In Albert's vision, workers and consumer councils use self-managed decision-making, balanced job complexes, remuneration according to duration, intensity, and onerousness of socially valued labor; and participatory planning. Parecomic will guide readers through this anarchist-influenced economic system, alongside the biography that led to its development—beginning with the heady days of 1960s student demos and lifestyle rebellions; following the developments of the antiwar, civil rights, women's, and Black Panthers movements; to the establishment of alternative media like South End Press and ZNet. Carl Thompson is a cartoonist based in Minneapolis. A graduate of the Minneapolis College of Art and Design, he has worked with writer Sean Michael Wilson on the political comic strip Green Benches, published monthly in the British magazine Blue and Green Tomorrow.